The everyday life of a caretaker's family. This series really is very very funny! Perhaps not everyone likes this sense of humor but i think that it´s really great, especially the actors (Tom Gerhardt, Axel Stein and all the others) are just superb. 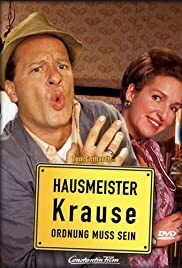 "Hausmeister Krause" is just different from all the other Comedy and Sketch shows in germany. But i´m a little bit sad that there are only made a few episodes (which only have 25 minutes) every year, so we always have to watch the old one. But that isn´t so bad, well, if you like humor which is a little bit "different", you should watch Hausmeister Krause, it´s really no waste of time!